There are two Ford Streets in Brooklyn– just as there are two West Streets (Gravesend, Greenpoint) two West 9th Streets (Gravesend, Red Hook) and even two Atlantic Avenues (Boerum Heights east to Cypress Hills and in Sea Gate). There are likely others I’ve missed. 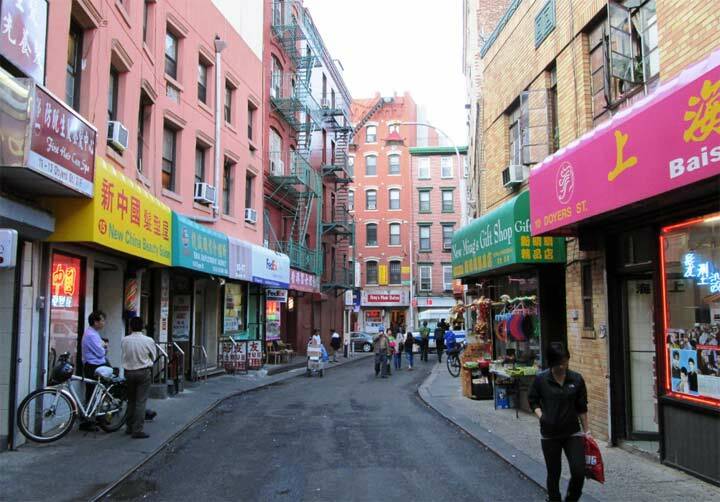 As a rule, New York City tries to avoid duplicating street names within boroughs, but not for the entire city (each borough has a Broadway and a Main Street). Sometimes, I suppose, it just couldn’t be helped. Boston has no such problems with duplicating street names; it has five Washington Streets, for example. If Ford Street comes to mind at all in Brooklyn, you’re likely thinking of the one in Sheepshead Bay. North-south streets east of Nostrand Avenue were allowed to keep their names instead of assuming “East” numbered streets otherwise used there. When the area was being surveyed in the late 19th Century, people who were assisting with the project had streets named for them, and thus, streets like Ford, Coyle, Batchelder, Brown, Bragg, Knapp and Haring were so named; Ford Street stands in for East 34th Street, which during surveying was redirected on a different grid southeast toward Marine Park. But, that’s not the Ford Street I’m talking about today. Today’s Ford Street is a narrow lane that runs for two blocks from East New York Avenue north to Carroll Street just west of Rochester Avenue in eastern Crown Heights. Ford Street may seem inconsequential today, but there’s a lot of history here. 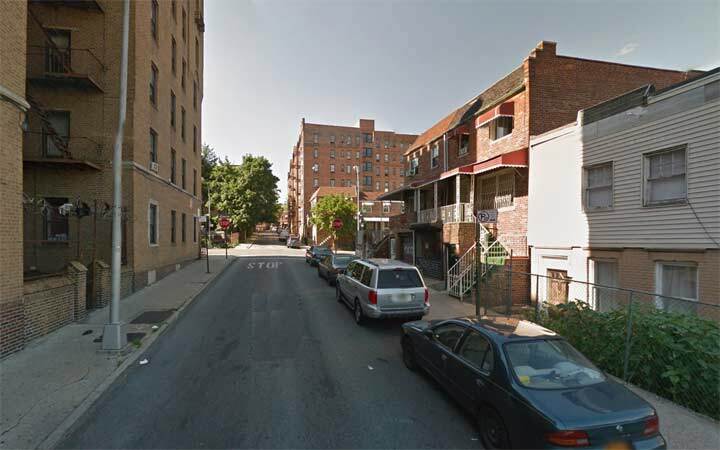 This is a part of Brooklyn where a number of neighborhoods such as Crown Heights, East Flatbush and Pigtown, now known as Wingate (though even that is not a common name) come together. 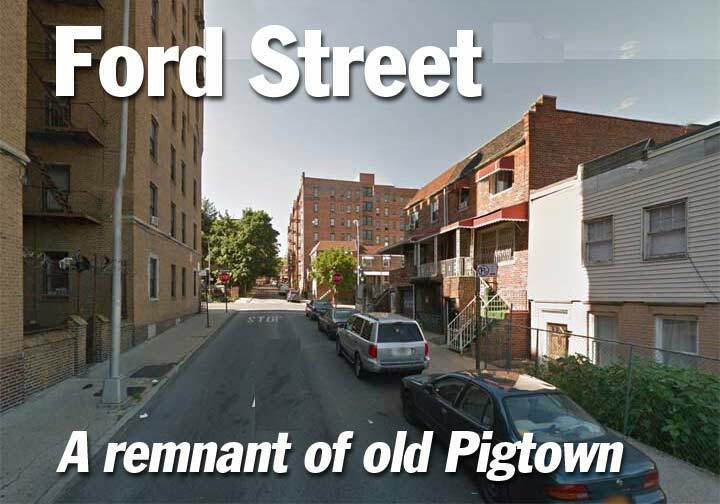 Pigtown was never sanctioned as a town or neighborhood name, but was thus called informally. According to Brian Merlis, whose book Brooklyn’s East Flatbush: Rugby and Pigtown Communities is the definitive reference, says Pigtown ran in general from Flatbush Avenue east to Rockaway Parkway and from the irregular Brooklyn-Flatbush town line, which ran along a then-hilly terminal moraine zigzagging in the Carroll Street route south to Winthrop Street. Today it contains parts of Flatbush, East Flatbush and Crown Heights. A small portion surrounding Wingate High School, named for General George Wingate, the founder of the National Rifle Association, was named Wingate in the 1950s. In general the “Pigtown” moniker has faded. But today, I’ll discuss and even more obscure southern section of Pigtown. 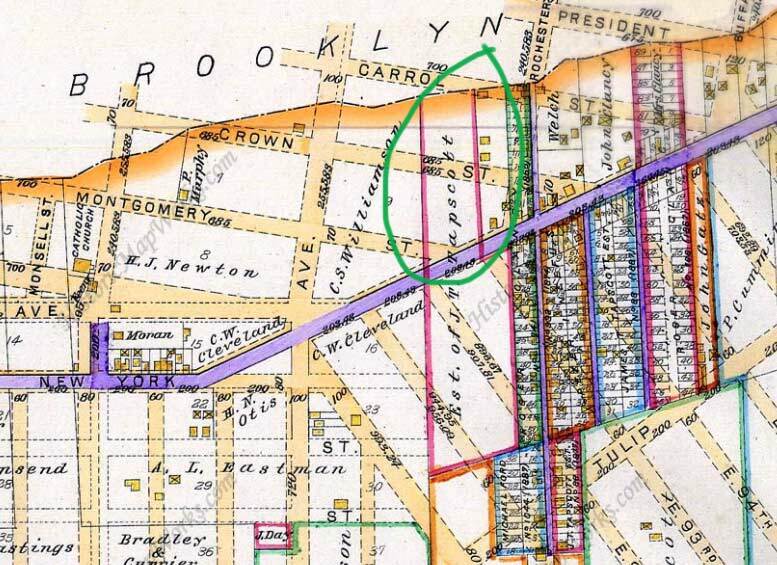 According to Merlis, a small tract called “The Oaklands” was surveyed and laid out by developer William Jarvis in 1853, with 3 or 4 north-south streets emanating from East New York Avenue (which further northeast became Jamaica Avenue, then Jericho Turnpike and NYS Route 25). 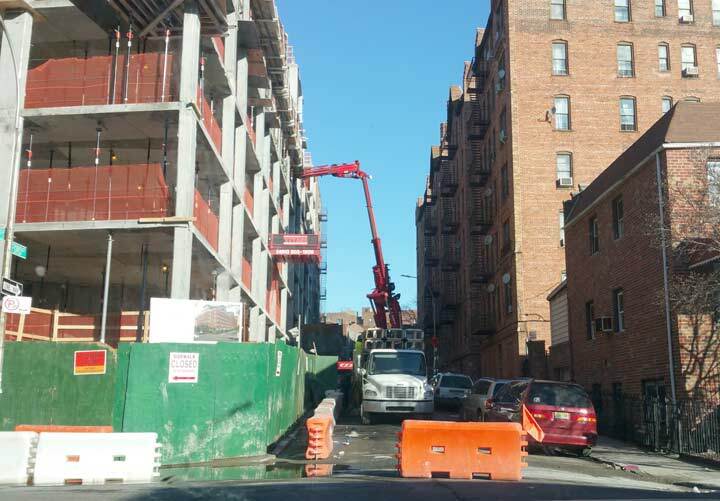 These streets were located between today’s ENY Avenue, Rutland Road, and East 92nd to 95th Streets. They were quite narrow and were lined with small one and two story homes. Ford Street, meanwhile, was the only street in The Oaklands which ran north of East New York Avenue. This map from 1916 is oriented with the north at left. By this time, Ford Street was laid out and several dwellings were built on each side. 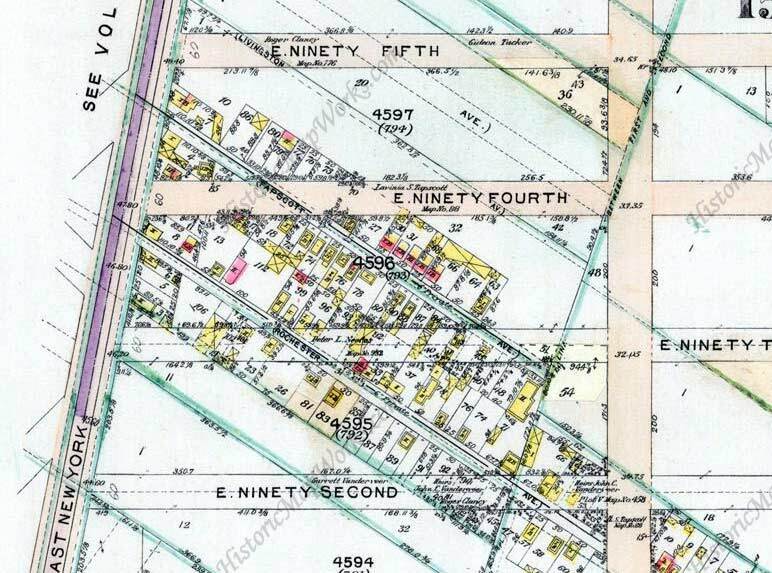 This map from 1917, meanwhile, looks at The Oaklands south of East New York Avenue. By this time, as you can see, a new grid defined by East 92-95th Streets, was already beginning to intrude upon the diminutive Oaklands section. Over the decades, all of the streets and small dwellings in the Oaklands would be eliminated. The final blow would be the construction of the PS 398 in the 1970s, now part of the PS 770 New American Academy complex. This leaves us with Ford Street, and its relics are fast disappearing. 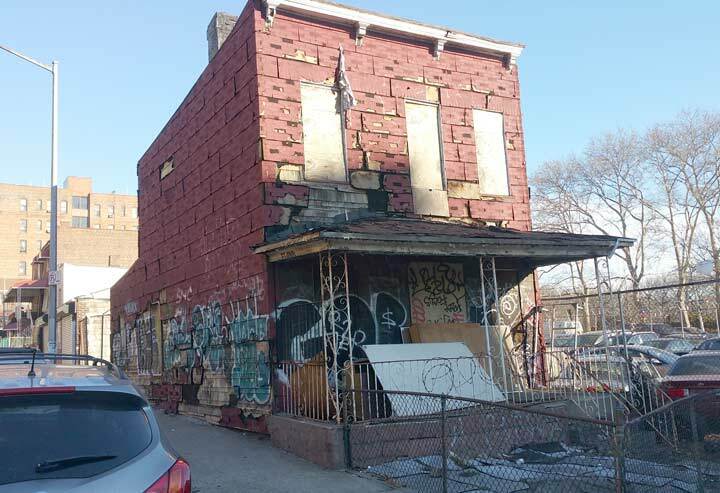 This abandoned residence at Ford and East New York Avenue is represented on the 1916 Ford Street map, but has been empty for years. 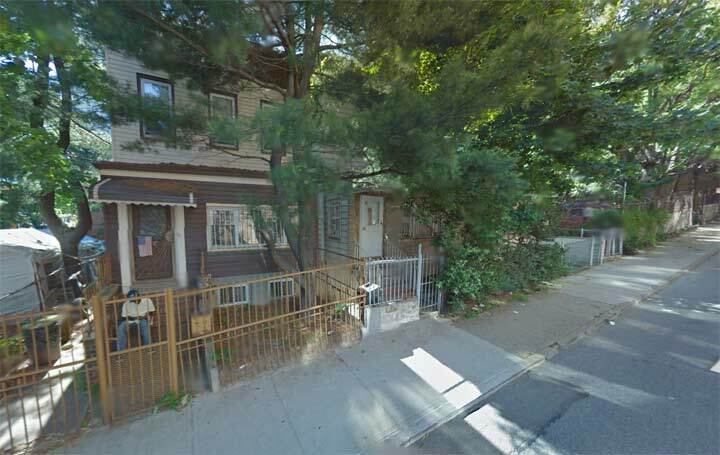 This Google Street View from 2012 shows an abandoned classic car in the back yard that has since been removed. This building on Ford between ENY Ave and Crown Street is quite old but has been resided in recent years. Here’s where the story gets a little disappointing. 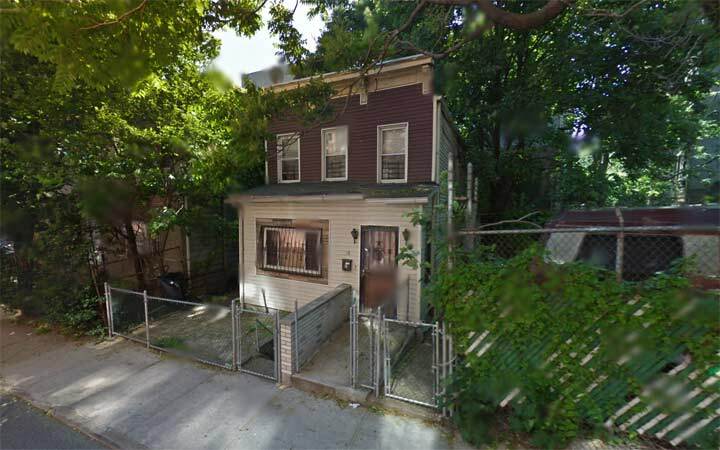 In 2012 Google Street View found three ancient residences on the west side of Ford Street between Crown and Carroll Streets. 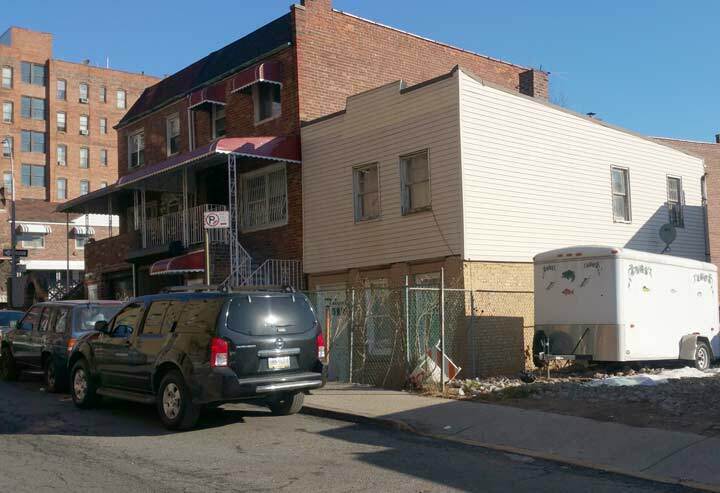 However, Forgotten NY correspondent Gary Fonville found that in early 2016 these buildings had been eliminated and a large structure was going up in their place. 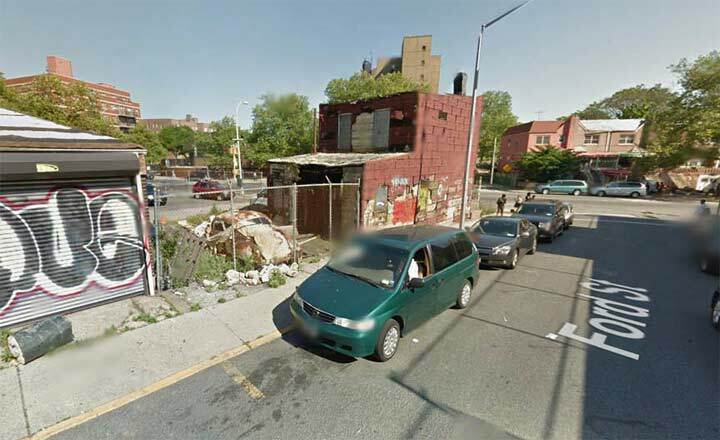 This pretty much closes the book on the development formerly known as The Oaklands, as only Ford Street itself and an abandoned shack at East New York are the only traces of it left! Very interesting article. 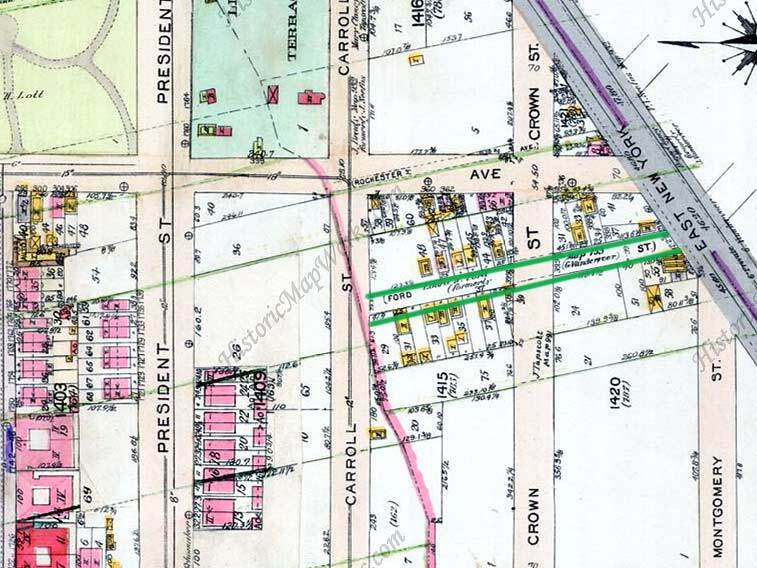 I especially enjoy it when you include old property atlases; they really sometimes illustrate how in certain areas, there was a wholesale destruction of intact subdivisions, in order to apply a new street grid in it’s place. Often, it appears that only the original important roads that connected existing “ancient” towns, were allowed to remain in place. In this place it is interesting to see how they applied three different street grids in this area. The “Oaklands ” neighborhood once extended further west, to the former Canarsie Road, roughly between Brooklyn and New York Avenues. From north to south it extended from the old Brooklyn city line to just south of Fenimore Street. It originally had its own street names, most lost to the sands of time. Even its own Broadway! From north to south these names were: Eastern parts of Crown and Montgomery Streets (which kept their names), eastern part of Malbone Street (Empire Boulevard), Broadway (Lefferts Avenue), Earl Street (East New York Avenue), Furnald (Maple) Street, Webster (Midwood) Street, Collins Street (Rutland Road) and William (Fenimore) Street. Oaklands never really stuck as a neighborhood name and the area was simply called Pigtown. Circa the 1920s neighborhood residents chose “Crown Slope” as a more respectable substitute for “Pigtown”; this name faded in the post-WWII era. This info was all gleaned from Brooklyn Daily Eagle articles. There’s an EARLE street in Middletown NY, with an E after the L, I just moved there from Sheepshead Bay. Also, a Bedford ave,Fulton st.,etc. ; and of all things a California avenue! And I sure wish I was back where I started from! …but the rent too damn high!